Hello, everyone. I am going to review a lip color from one of my recent Diva Likes haul. Liquid lip color is ruling the beauty world and how! Needlessly to say, I have used a couple of liquid lip colors and they are quite easy to use and apply. These lip colors are long wearing and thus you don't need touch ups every now and then. India has few number of liquid lipsticks and Maybelline is one of them. I have worn this color for few occasions and here's my review on it. Now keep your lips fresh through 200 bites, 120 sips, and countless kisses. Meet the 24-hour lip color that stretches the limits of long-wear. The 2-way lipstick includes a liquid lip color on one end and a lip balm on the other. Formula with Micro-Flex looks & feels fabulous throughout the day. Available in a collection of new amped-up shades. • Long-lasting lip color keeps lips looking and feeling freshly applied. • Gives you high coverage without bleeding. • Flex formula keeps the Lipcolor gorgeous for up to 24 hours. • Glides on and looks gorgeous all day. • No crumbling, no caking, no fading, no feathering, no transferring. ⦁ Step 1: g2417 isododecane, trimethylsiloxysilicate, nylon-611/dimethicone copolymer, disteardimonium hectorite, lauroyl lysine, c30-45 alkyldimethylsilyl polypropylsilsesquioxane, alumina, propylene carbonate, synthetic fluorphlogopite, silica, calcium sodium borosilicate, calcium aluminum borosilicate, polyethylene terephthalate, parfum/fragrance, aluminum hydroxide, acrylates copolymer, benzyl alcohol, dimethicone, paraffin, tin oxide. [+/- may contain/peut contenir mica, ci 77891/titanium dioxide, ci 77491, ci 77492, ci 77499/iron oxides, ci 15850/red 7, ci 15985/yellow 6 lake, ci 45410/red 28 lake, ci 45380/red 22 lake, ci 19140/yellow 5 lake, ci 42090/blue 1 lake, ci 75470/carmine] f.I.L. D41008/5. ⦁ Step 2: g2296 trimethyl pentaphenyl trisiloxane, is-diglyceryl polyacyladipate-2, ozokerite, cera alba/beeswax/cire dabeille, calcium sodium borosilicate, calcium aluminum borosilicate, tocopheryl acetate, parfum/fragrance. [+/- may contain/peut contenir mica, ci 77891/titanium dioxide, ci 77491/iron oxides] f.I.L. D8974/11. • Step 1. Apply liquid lip color to clean, bare lips. • Step 2. Allow two minutes to dry, then apply the ultra-conditioning balm to seal in moisture. • Step 3. Reapply balm as needed. • Step 4. Remove with an oil-based makeup remover. Maybelline New York Superstay 24 Color 2 Step Lipstick 065 Constantly Cabernet is a two-step lip color. It has dual ended body with a lip balm and liquid lip color. Both the sides are easy to open. The lip color side has screw system with a wand attached. The lip balm side has a twist up mechanism. The products are brilliantly packed into one and the lip color portion is transparent which enables you to see the shade clearly. The shade name is also written on the bottom but the font is extremely small. The product is light weight, efficiently packed and travel-friendly. The wand has a slightly slender body with a pointy tip. It is surely a good wand and helps to line and coat the lips well. Overall, the packaging is really good including the wand. The shade Constantly Cabernet is a dark purple-plum color with no shimmer or glitter. 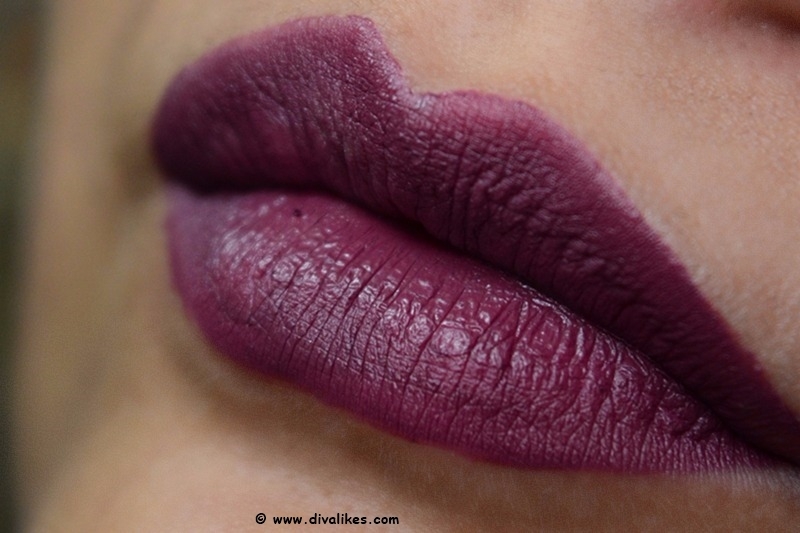 The color is downright vampy and looks pretty bold for fair to medium skin tones. For dusky to deeper skin tones, this can be worn with much grace. For my NC42 skin tone, this is a perfect winter shade and not exactly something I would prefer in broad daylight or in bubbly summer. Nevertheless, the shade is a stunning dark bold color. The pigmentation of the color is very good as single swipe deposits maximum color and proper layer gives an opaque finish. It hides the pigmentation well and gives a neat look to the lips. The texture of both the liquid lip color and lip balm is good. The lip balm is transparent in color and gives a hydrated touch. It is not waxy or oily but has the right consistency. The lip balm bears no smell as well. The lip color has a medium-thin consistency and applies well. It is easy to spread the lip color if the lips are exfoliated beforehand. Although the lip balm is supposed to be applied in step 2, I exfoliate the lips and apply a thin layer to hydrate the lips and if necessary, blot the excess with a tissue. Then I apply the lip color. You have to let it set for few minutes and then apply the lip balm to get a long lasting finish. You can also skip step 2 for a matte look. It feels slightly dry because my lips are naturally dehydrated but nothing uncomfortable as such. The formula is completely transfer-proof and smudge-proof. It does not highlight any fine lines on the lips nor does it settle into them. It can survive any kind of food. It stayed on my lips for the whole day. Although the staying power sounds amazing, removing the lip color from the lips is a pain. None of my makeup removers could remove except coconut oil but I had to vigorously rub the lips. As a result, my lips were badly hurt, red and swollen. Constantly Cabernet is a dark purple-plum color with no shimmer or glitter. Perfect vampy or fall shade. 2 in 1 lip color. Stays for the whole day. Can be a little dry for the whole day (You can touch-up with the lip balm). Removing the color from the lips is a pain. I do like the lip color but I have mixed thoughts. The color is pretty but best suitable for winters. Also, the quantity is less and removing the color hurts. So overall, go for the range only if you like a particular color.